Home » Uncategorized » We’re all about George! Most of you probably know that many Brits are obsessed with baby Prince George. Around the time of his birth almost two years ago, people were hit with what is known as royal baby fever and we’re sure this will start up again when his baby sister/brother arrive (would could be any day now!!!). But a very long time ago, there was another George that captured the hearts of the English and was named the Patron Saint of England. So the English have both Georges very close at heart. The Council of Oxford declared in 1222 that St George’s Day would fall on the 23rd April. However, St George did not become the Patron Saint of England until over a hundred years later in 1348. In 1415, considering St George was the Patron Saint of England it was only natural that the day was declared a national holiday in England. However, soon after the union with Scotland at the end of the 18th Century, the tradition fizzled out and since it hasn’t been widely acknowledged and is no longer a national holiday. It’s not as widely celebrated or commercialised as St Patrick’s Day. It was a tradition to fly the St George’s flag and where a red rose on this day. The red nose has long since been the national emblem and symbol of England. Did you know that one of the most if not the most famous English playwrights, William Shakespeare died on the 23rd April 1616? It is for this reason that UNESCO marked this historic date by declaring it the International Book Day (in honour of the English playwright). Legends and myths about St George and his life have grown and changed slightly over the years, because for many years these stories were told by word of mouth. But he must have been a pretty unforgettable character for his reputation to have lasted to this very day. It may not be a national holiday but it’s still dedicated to him! And the very English flag is in remembrance of his bravery before that dragon (more about that later!). He moved to Palestine with his Mother and became a strong Roman soldier. However, he later left his military post and protested against his pagan leader, the Emperor Diocletian (245-313 AD), who led Rome’s persecution of Christians. His rebellion led to his imprisonment and it led him but even with the poor conditions and torture he endured he remained faithful to his beliefs. The angered emperor had St George dragged through the streets of Nicomedia, Turkey, on the 23rd of April 303 AD and had him beheaded. The Emperor’s wife was struck by St George’s bravery and dedication to his religion that she decided to become a Christian herself but was later also executed because of her religion. It wasn’t only at the end of his life that St George showed strong bravery but according to legend he also well known for slaying a dragon! The legend is set in a town plagued by a dragon in Libya. It is said that the inhabitants of this town had to send two sheep a day to feed the dragon and keep him happy and when there weren’t any left the emperor of the town was obliged by the town’s people to send his daughter despite his protests. The emperor’s daughter was dressed in white and taken to the dragon’s lair but as the dragon approached, St George appeared and asked the emperor’s daughter what she was doing there. He saw the dragon and decided to wound it and take it back into the town with the help of the emperor’s daughter. 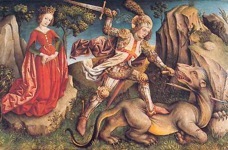 The emperor was ever so grateful to St George for saving his daughter’s life but St George said that he would slay the dragon if people would convert to Christianity. People obliged and St George proceeded to kill the dragon in order to rid the town’s people of his malice. It was on the spot that the dragon was killed that it is believed people were baptised into Christianity and a church was built. Now that you know the legend behind St George and the dragon, you’d probably be interested to know that the Red Cross on the English flag supposedly resembles the blood spilled by the dragon when St George killed it. The cross is most probably a reference to Christianity. Even though people say that the English should have more of a patriotic streak, the holiday has not been celebrated as a national holiday since the 18th century. However the link to St George still persists to this very day and surprisingly its popularity has been on the rise again over the last few years. In old times, it used to be a tradition to wear a red rose on St George’s Day just like people wear red poppies for remembrance day today but this practice has been discontinued. Instead, it is a very common occurrence to see an array of St George flags displayed in pubs across the UK. London: If you’re anywhere near the capital then hundreds of events have been organised to celebrate this day. The main festivities already happened on Monday, April 21 from noon to 6 pm in Trafalgar Square, where there was a feast of traditional English food and free entertainment for everyone. There will be a market for British products with around 20 stalls where taste roasted pork, homemade cakes, pastries and freshly squeezed lemonade and a conditioned to eat for up to 250 people between the iconic Trafalgar Square area sources. This is perfect for foodies who love testing out new or traditional food cooked by the countries finest chefs. Whatever you do, we hope you have a fantastic St George’s Day!!! By worldchoiceeducation in Uncategorized on April 23, 2015 .